As a Master Electrician, Cliff can tell pretty quickly when a home is not properly wired. But not everyone, even some other electricians, has the same knowledge and experience he has. 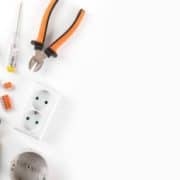 It doesn’t matter what age your home is, if it’s a brand new home and the contracting electrician was hurried and not doing their best work, things can still go wrong. We want you to know that electrical issues are very serious and you should always get things checked out if you see warning signs. Electrical shock when you plug in or touch a cord. Even if you haven’t had any of these issues, if your home is more than 30 years old, it would be a good idea to have an inspection.